Today’s beautiful animals were all photographed at my favorite zoo, the Central Park Zoo. Enjoy! Tomorrow, April 8th, is Zoo Lover’s Day. – It is estimated that over 600 million people visit zoos each year. – There are more than 2,800 zoos and aquariums in the world. – Germany has more zoos than any other country – 414! – The US has more than 350 zoos. The total number of AZA accredited zoos and aquariums is 221. – Over 30 US zoos have more than 1 million visitors a year. Disney’s Animal Kingdom has the most with 9.5 million visitors each year. – The Philadelphia Zoo is the oldest zoo in the US. It opened on July 1, 1874. – The oldest running zoo in the world is the Vienna Zoo in Schonbrunn. It was founded in 1752. – With over 1,500 species, Germany’s Berlin Zoo has the largest variety of animals in any zoo in the world. – The largest zoo in the US is Red McCombs Wildlife with over 12,500 acres. Why not go out and visit your favorite Zoo, enjoy the outdoors and see some amazing animals? What is that red headed beauty at the top? 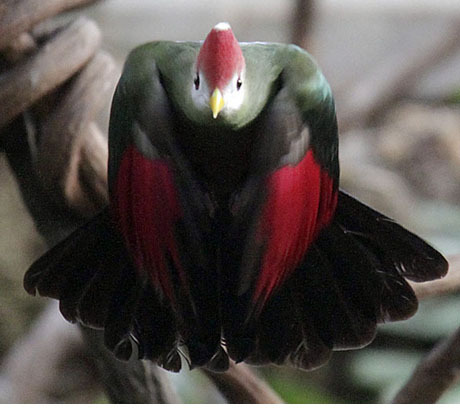 That is the sensational Red-crested Turaco! wow, awesomely beautiful birds, never knew there was a solid yellow parrot, wow, can’t get over how beautiful these birds are thanks for sharing these photos. when the flowers bloom around here I plan on taking photos and putting on my blog wisdom of the ages. We need one more zoo factoid, how many different zoos have you visited? Almost HALF of AZAs accredited ones, no?? awesome as always!!! Love the bat shots especially! Enjoyed your zoo summary. I didn’t know there was a zoo Lovers’ Day�.. I did not know that there was a ZOO LOVER’S DAY. Shame on me. These facts are so interesting. Thanks Juidith for sharing them. Love Love Love these photos. Best bird photos I’ve ever seen. What a great montage! And I agree with Mary- How many zoos have you visited?